Holden's crew searches the war-torn station on Ganymede in search of a scientist connected to the protomolecule experiments, while Prax hopes for a sign that his daughter is still alive. On Earth Bobbie attempts to escape from the MCR's watchful eye, and Errinwright comes clean to Cristjen his connection to Jules-Pierre Mao. Last edited by GateWorld; April 12th, 2017 at 10:50 PM. Loved this episode. 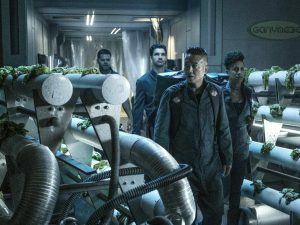 I'm glad that Errinwright came clean about working with Mao and that Avasarala knows about the protomolecule. I really liked all the stuff with Bobbie. I've been finding the stuff with the the UN on Earth more interesting than what's been going on with Holden and crew lately. Sadly for me, Avasarala keeping up her pursuit of knowledge was about the only really engaging part of the episode. That said, we've been given one hugely important point of view on Earth via Bobbie. It's likely I've mistakenly been imagining that, but somehow I considered Earth as a relatively peaceful and plentiful planet for everybody. In stark contrast to the Belt (naive, I know). Clearly there's enough poverty and misery on Earth as well (I wonder how many Belters or Martians for that matter ever wondered about that). What is the Medussa Cascade?